During his career, renowned Cowboy artist William T. Zivic has explored other artistic forms outside of his normal Southwestern milieu. This Original piece from his private collection represents one of a handful of pieces he has composed in the "Abstract Expressionism" form popularized by the late Jackson Pollock. Pollock himself was fascinated with Native American Navajo sand painters and lists them as one of the inspirations for his "Action painting" style of composition. In this sense, Mr. Zivic and Mr. Pollock share a common interest in the peoples and cultures of the Great Southwest. Originally, priced at $5000, this piece has been marked down on eBay. 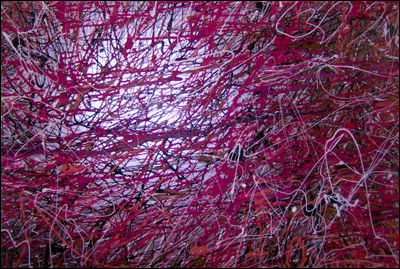 Entitled "Anxiety", it is a large piece (36" x 48") consisting of acrylic on canvas. The piece is done on gallery roll and needs no frame -- ready to be hung in the location of your choice. During his over 45 years as a professional artist, Mr. Zivic has created and sold a prolific 30,000+ pieces of Original art. But as mentioned before, he has created only a handful of pieces in this particular style.